The time is right for NHL commissioner Gary Bettman to help create a single women’s professional hockey league. While it’s nice the rapid-growth sport of women’s hockey has two leagues for elite-level players in the Canadian Women’s Hockey League and National Women’s Hockey League, it would be better if the two leagues could come together as one home for the world’s best. Bettman has stated as much. So have NWHL commissioner Dani Rylan and interim CWHL commissioner and Hockey Hall of Famer Jayna Hefford. This has been speculated since last summer. There have been whispers the best outcome would be for the NHL to provide its infrastructure, marketing and branding to unite the two leagues. Buffalo Sabres owners Kim and Terry Pegula have already taken the lead. They own the Buffalo Beauts and made it a first-class NWHL organization. The Calgary Flames, Montreal Canadiens and Toronto Maple Leafs have partnerships in CWHL clubs, but the men’s teams could do more. The women’s hockey market has been bursting at the seams for a couple of decades. A combined television audience of 8.5 million North Americans (4.8m in Canada, 3.7m in the U.S.) watched the United States’ dramatic shootout win in the Olympic gold-medal final in Pyeongchang, South Korea, last year. The NWHL’s Isobel Cup final last Sunday, in which the Minnesota Whitecaps required an early overtime goal from Lee Stecklein to defeat Buffalo 2-1, was played before a sellout crowd of 1,200 in St. Paul, Minn., that likely could have quadrupled had the championship game been housed in a bigger arena. 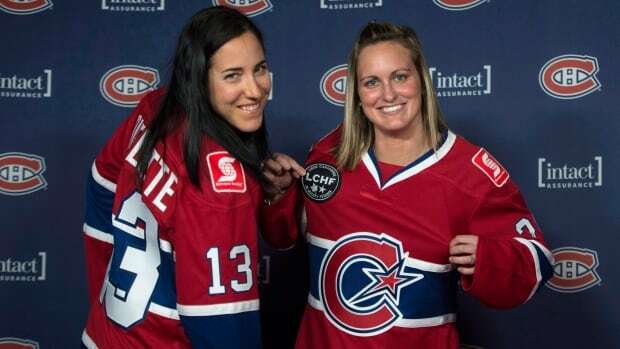 The Clarkson Cup final between Les Canadiennes de Montreal and Calgary Inferno at the 8,500-seat Coca-Cola Coliseum in Toronto on Sunday is 75 per cent sold out and will have a national television audience in Canada and the United States. Former Canadian national team member Cheryl Pounder can provide a good perspective. Next month, she will celebrate the 25th anniversary of when she burst on to the scene as the youngest blue-liner on the Canadian team that won the 1994 world championship at Lake Placid, N.Y. Is there a better place for hockey dreams to come true? Pounder’s hockey dream began on the streets playing with her brothers. She went on to win six world titles and two Olympic gold. Now, she helps inspire youngsters with her can’t-miss public speaking engagements and as a coach in the Brampton Canadettes system. She currently coaches her daughters Jaime, 11, and Lauren, nine, on the Canadettes atom A-team. This is an exciting weekend for the Pounders. Lauren and Jaime accompanied their mom to the CWHL awards on Friday evening, in which Cheryl was one of the presenters. They will all be at the Clarkson Cup final on Sunday. “To see the growth in the women’s game has been awesome,” said Poulin, a former CWHL board member. “The national teams, the world championships and the Olympics have been so important to this growth. “But it’s also been great to see the growth of the game through the CWHL. The speed and quality of the game are so high right now. It puts on display that young girls one day have an opportunity to play the game at a high level, not just in the national team environment. When, or if that one direction, will happen with the five-team NWHL and six-club CWHL remains to be seen. But it’s an important next step for women’s professional hockey. They need stability. They need to have salaries that allow them to be full-time professional athletes. The opportunity is there for the NHL — now. It’s OK that young girls want to become the next Sidney Crosby or Connor McDavid, but it’s better if they strive to become the next Angela James or Marie-Philip Poulin. Poulin won the Angela James Cup as the CWHL leading scorer and the Jayna Hefford Trophy as the MVP as voted by her peers. Wearing a stylish fedora, she was on target when she said in her acceptance speech.